Several uniform options are available. A dress code that minimizes distraction and builds Esprit de Corps. Sacred Heart Catholic School maintains a uniform dress code and all students (K-8) are expected to adhere to all of the policies regarding this code. The complete dress code can be found in the Sacred Heart Catholic School Student Handbook. 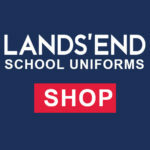 The preferred Sacred Heart uniform supplier is Land’s End. Sacred Heart has an official Land’s End order portal for your student’s uniform needs. Please visit the page at Land’s End.